In Great Britain and similar democracies, multiple parties can act as a coalition to elect a prime minister. But that prime minister's administration will fall apart if the government runs into a crisis that shatters the coalition. This can put a prime minister into a politically shaky position in a crisis, right when a government needs to be the strongest. The founders wrote the Constitution to form "a more perfect union", i.e. one that established a stronger federal government than did the Articles of Confederation. And they thought that a majority-vote president was part of ensuring that stronger federal administration. Equally a Presidents Administration may run in to crisis if they don't have the backing of Congress, and the Mid Terms can be a very difficult period in a Precidency. Then you have a maximum of two terms, meaning that an outgoing President is for a time a Lame Duck President. Do explain? I’m tired and not seeing how free market pertains here. I’m not satisfied with the current state of politics. I’ve been apathetic in general for years because of this mess, though I regained interest because of who the two main candidates were. Maybe it’s wishful thinking that things can change. We complain about what we get, but don’t really try to change it. In the free marketplace of ideas, 'what we have is what we got' re: government. The free market decides our elections, are you saying you're satisfied with the outcomes? Does free market in this sense mean we are free to vote for whoever, so the results are what the majority want, right? Depressing thought. I’m not for trying to make people vote 3rd party, of course, just wishful that more would do it. 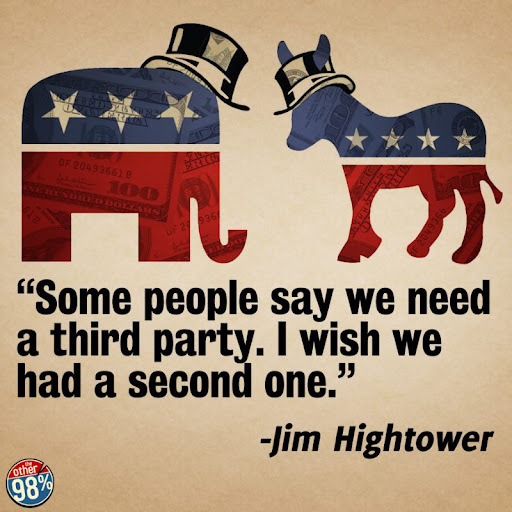 At least some out there would vote for 3rd parties already, but have been convinced it could never mean anything. Sigh. We need new parties. Oh well. Yeah, that’s what I realized after I asked you. I wonder what it would take for people to change. Maybe it won’t in my lifetime. Humans still have a primitive tribal mentality. Us vs them. The two party system exploits this and manipulates people into supporting what they don't really support because X is done by "them" and Y is done by "our side."